“One winter morning, at a few minutes past eight o’clock, we (a party of seven) left Millbay Station at Plymouth for Princetown, via Horrabridge, where we resigned ourselves to the tender mercies of the Princetown Railway, then recently opened. 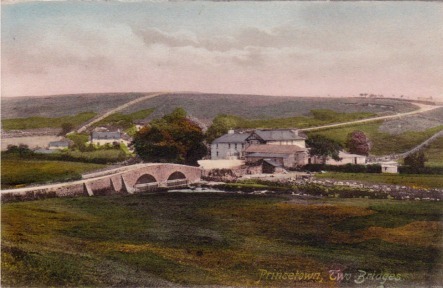 The railway from Plymouth to Horrabridge runs through the most charmingly sylvan scenery, the greater part of Bickleigh Vale being visible as we proceed, but upon leaving Horrabridge by the Princetown route the scenery changes, and moorland tors rise up around us, and wild uncultivated tracts of country are visible, clothed for the most part in gorse and heather, which in their season add a wondrous charm to this otherwise barren mountain land. After passing Sheeps Tor, the reputed haunt of the pixies, which looks very grey and cold in the light of a winter morning, the views increased in grandeur, and become more and more expansive. The curves of the extraordinary bit of ‘iron road’ might well make the timid heart quail, but our progress, if slow, is sure. Now, we almost cross the summit of one of those strange-looking tors, with which nearly every hill is crowned, anon we shoot down the incline with more velocity than comfort, and speed across a plain which looks as though there had been a hailstorm, and the stones instead of melting into nothingness had petrified, and then grown and grown into huge masses of granite, in all sorts of fantastic shapes, which kindly time has covered grey – almost the same tint as the lichen, which is so plentiful and so varied here, covering nearly all these immense stones. Wild Dartmoor ponies came into view from time to time, but not a human being appears into sight until on arriving at Princetown we are met at the station by a small crowd of children, whose quaint garments appear contrived with a view to warmth and durability rather than elegance. As soon as the carriage door is opened we are inclined to applaud the wisdom of their mothers, for the wind is intensely cold, chilling us to the very marrow. 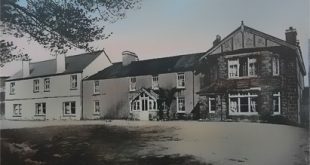 Looking at each other with faces of comical dismay, we by mutual consent male a rush for ‘The Hotel,’ where we are regaled with coffee hot and strong, deliciously mellowed with a liberal allowance of Devonshire cream and some substantial fare. Sallying forth again, we walk through the ‘town’ as far as the far famed Dartmoor prison, meeting on our way several convicts closely guarded by iron-faced warders, each bearing a loaded rifle. Having seen the prison gateway and courtyard, we retraced our steps by the same route and make direct to the moor. The wind is blowing full in our faces all the way, but cold though it is, it is wondrously exhilarating, and we all feel equal to almost anything in the way of walking and climbing. A grand expanse of moorland meets our eyes in every direction, hill beyond hill, and tor beyond tor, grey and rugged against the clear blue of the sky. A brisk walk of rather more than two miles brings us to ‘Two Bridges,’ a green oasis in the barrenness and sterility of the moor. After passing through a farmyard, we enter a wild region indeed, in the very heart of the moor, but there being no regular road or pathway we pick our way with great care. Some patches of lovely emerald moss, fringed with rushes, warn us of the vicinity of quagmires, but we manage to evade them. Not a hedge, not even a bank may be seen – only walls of the Dartmoor granite, composed of pieces of irregular sizes and shapes, which had been piled up by the convicts with infinite labour and patience. As we march along, enjoying to the utmost the pure, bracing air and the sense of freedom, the sun comes out with such power that we are glad to throw ourselves on the thick moss which abounds everywhere, and take a brief rest in the warmth and brightness ere we essay to explore and admire the charms of Wistman’s Wood. Strange, eerie, and uncanny is the appearance of these ancient trees. As we first sight them they vividly recall some pictures of Dore’s in Dante’s ‘Inferno.’ Here is a dwarfed specimen which resembles an orangutan with limbs contorted as if in a fantastic dance. Another, lichen covered and gnarled suggests the figure of a little old man, with arms stretched outwards as if in earnest appeal. After sitting a while on one of the huge boulders (which the abundant growth of moss has converted into a luxurious seat) and gazing our fill at the wonders of this pre-historic wood (for such it is), we scramble over rocks and stones, holding on to the branches of the pygmy trees, feeling half relieved when we are out of the ‘wisht’ place, as it is spoken of by the neighbouring folk, who would not on any account venture within its shadow at nightfall. Tradition says that the wood was planted by Isabella de Fortibus, Countess of Devon and Albemarle in the thirteenth century, but Mrs. Bray justly remarks that ‘To any one who has visited the spot it is evident that no other hand has planted it than that of God.’ Certainly it is very wonderful that trees, or, indeed, vegetation of any kind can exist in such a region of stones. Soil there seem to be little of none, but these dwarfed old oaks, reaching at the utmost height are not higher than a man may reach with his hands, and covered with an immense growth of moss, appear literally to spring from a mass of rocks, also moss grown. On emerging from the wood we find that we are at the top of the hill; quantities of broken granite strew the declivity, and rich and varied are the treasures of moss-lichens and variegated ivy which we gather. Toiling, with no little exertion, over these boulders, we reach the valley beneath, where runs a noisy stream (one of the many tributaries of the Dart), singing as it dances along its way to the sea, over fragments of boulders and pebbles, now and again whirling with many an eddy round some little sandy bay. Presently we climb the hill again and ascend Crockern tor, whence one of the finest views is obtained. We are told by history, backed up by local authority, that here were held the Stannary Parliaments after the accession of Edward I. The summit like those of the other tors around, is bestrewed with broken granite, amongst which the hardy tinners sat to regulate the affairs if the Stannaries in days gone by; and the blocks still present the appearance of seats arranged round a rough tribunal. The cold wind – colder than ever at this altitude – warns us not to linger, and so we descend and cross the moor again, revelling in the strange, weird beauty of the scene, and noting the varying colours – one of the chief charms of charming Devon – the blue haze clouds begin to gather and obscure the hilltops. A snow storm now overtakes us and we walk rapidly along, and reach Princetown just in time for tea which, supplemented by more substantial viands, is awaiting us. The long walk and the keen air have so sharpened our appetites that we eat with the utmost zest the good things provided for us. After that, the weather having cleared, we make another tour of the prison walls, meeting several gangs of convicts and warders. In one place a number are engaged adding to the already huge dimensions of the prison. Looking up, with the interest these unhappy beings inspire, I catch an unmistakably saucy glance from a pair of dark eyes, the owner of which actually has the audacity to kiss his finger-tips to me with quite an airy grace. On our way we pass the burial ground where are interred the French prisoners of war. A handsome granite monument gives the names and rank of those dead-and-gone patriots. Returning to the village we pass the church, a small but massive building of native granite. We observe on the north side of the churchyard the graves of the convicts; inexpressively sad is the sight of the row after row of nameless graves, one along having a headstone, on which is engraven the letters ‘L.D.C.’ Conjecture is in vain, for we can glean nothing of the history of him who lies beneath from the sexton, who is hopelessly stolid and uncommunicative. With but little regret we leave Princetown itself, though the excursion has been so delightful, for the place has a somewhat depressing influence upon us, especially in the early twilight of a winter afternoon. The thought of the eleven hundred human beings cooped up within the walls of that gloomy prison, so near us, yet so isolated, and so bereft of the sympathy of their kind, deepens the feeling of sadness, and makes us cling more closely in thought to our own loved ones and home. We are soon whirled away out of the region of the tor-capped hills, now mystic and weird in the uncertain light; the spell is broken, and once more we take up the tread of everyday life again.” – F. G. – The Graphic, 1886.